E.R. RAMACHANDRAN writes: This is a tale of two roads in Mysore: the Janata marga and the Raja marga. The Janata marga is the Krishnaraja Sagar road, in short KRS Road. Ever since the present ‘rulers’ of Mysore cast their eyes on this road, it has seen only misery. Thousands of commuters used this road daily to reach their offices, shops and schools, and to go to the railway and bus stations. On the weekends, lakhs of tourists from all over the country used it because it connected the City with what used to be one of its most famous tourist attractions, the Brindavan gardens. Such a vital link has been closed for more than a year. Reason: A “multi-disciplinary project” involving the railways, Vani Vilas water works, electricity department, public works department, Mysore city corporation, etc is going on here. The work involves doubling the rail track, re-laying the pipes for water supply, re-erecting lampposts for electricity and asphalting the roads. But a year on, there is no end in sight to this magnificent project. So, in these days of high costs of petrol and diesel, commuters and tourists are forced to take detours on roads not equipped to take the load, spending extra money, wasting time and wasting fuel. No one knows who is in charge; so no one knows who to hold responsible for the mess: there is no coordinating agency, at least not one which we, the public, have been told, which monitors the work by the various departments and which specifies the date of commencement of work and its completion and the total cost. Just what is holding up the project completion is unclear when other more important works are taken up round the clock and finished in record time in other cities and even smaller towns. And as we speak, nobody knows whether it will be completed in the next 40 days, as announced by one of the officials, or if it will take another four months at least according to some other “experts”. The Chief Minister comes here every now and then for his prayers and distribution of money, and the district in–charge Minister stays very close to this road. Nobody seems to be bothered. That is what happens to Janata marga. It is nobody’s baby really. But the Raja marga is different. The Raja marga is supposed to become the ‘pride’ of the administration. It is supposed to cost Rs 18 crore to upgrade a present stretch of a road of 4. 5 kms and make it the mother of all roads. Naturally everybody is interested and involved. As the name suggests, it will be a ‘Royal Road’ in the heritage city of Mysore, giving tourists ‘a feeling of going back to around one hundred years’. 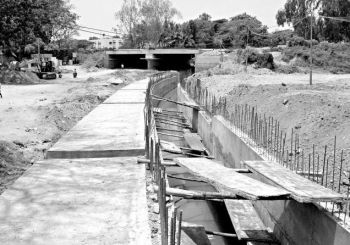 The first phase of work (between Hardinge Circle and K.R. Circle) is likely to be completed before this year’s Dasara festival. The highlights of this project are a carved stone barricade, slabs to cover the storm water drain, ornamental lamps and tiles. These are supposed to depict the royal days of the Wodeyars. Only, to facilitate this “feeling” of going back by 100 years, around 250-300 full grown trees will be felled without which the Raja marga cannot not be completed! The Raja marga will be put to use for about four hours in a year and it is meant for tourists who can’t even walk on the road. The KRS road which is used by thousands of tourists and commuters, can at best be described a mudtrack, basically meant for bullock carts with potholes and cannot even be termed a decent road. Most of them come back with problem of backache once they traverse up and down. It is a shame the Government cannot concretise the road or at least ensure there are no potholes and unevenness for the entire stretch. Maintenance of this important road seems to be totally absent. And we have money that is being poured into Raja marga in the name of tourists to give them a feeling of royalty hundred years ago. The maharajas of Mysore and their Dewans, Sir M. Visveswaraya and Sir Mirza Ismail, and Pandit Jawaharlal Nehru in whose name this disgrace called national urban renewal mission (JNNURM) is being conducted… wish you were all here. You are all missing something. This entry was posted in Issues and Ideas, Mysore-Bangalore, Rajas & Maharajas and tagged Brindavan Gardens, Churumuri, Hardinge Circle, Jawaharlal Nehru, JNNURM, K.R. Circle, KRS, Mirza Ismail, Mysore City Corporation, Mysore Dasara, Sans Serif, Sir M. Visvesvaraya, Sir Mirza Ismail, Wodeyars. Bookmark the permalink. ← CHURUMURI POLL: Assembly polls, UPA or NDA? Nice piece by ERR. Wish some activist like Prof PV Nanjaraja Urs files a PIL in court against Raja Marga. The authorities are destroying a heritage road in the so called heritage city of Mysore out of funds sanctioned for heritage preservation! Sayaji Rao Road was named in honour of Sayaji Rao Gaekwad of Baroda as a mark of his visit to Mysore. Baroda and Mysore then shared common interests. The two Maharajas were had a very cordial relationship. Seeing the way the Mysore rulers had developed Mysore as a beautiful well planned city, Gaekwad copied some of the ideas of Mysore for Baroda. Now this historic marking is being erased out permanently. Wonder what the Directorate of Heritage, Govt. of Karnataka, INTAC activisits, historians, and civil society activisits are doing. What is it with this Govt and felling trees?? Most illogical thing ever! Bunch of fools. ERR Sir, It is happening almost in every city in our country and in every major locality. There is nothing new in this. Projects are taken up in the name of infrastructure development, progress, to ease the traffic etc. It is all humbug. The real reasons are known to the people. And we the common people are helpless, what with everyone being busy in earning his livelihood. This ‘developmental thing’ reminds me of a cartoon by R.K.Laxman. A person pointing to a flyover says: This flyover was built to ease the traffic congestion, the flyover above the flyover was built to ease the traffic congestion on the flyover….! Thats it sir! Unfortunately!! So much of inbuilt anger and a feeling of helplessness. As mute spectators we watch the city slowly coming apart!! Who actually designs these new roads. Can they not retain those trees and still do some innovative designs. Is it the State PWD, if so no wonder it will be catastrophe. Abroad, before felling a tree, it will be notified in newspapers and public opinion is sought. Also, if a tree is cut, it becomes a lead news item in a newspaper with reaction from the residents of the concerned area. Transparency demands that authorities should notify felling of trees and all projects of public concern for public opinion. But who cares for transparency in this country?